As a project for Seth Davis and Sports Illustrated, I compared all men’s basketball exhibition games played by teams from the Atlantic 10 and ACC in 2013-14 (28 games) and 2014-15 (30 games). The sample size is admittedly small. Better data could have been gathered had more (or all) conferences experimented. The NCAA has already announced that the experimental rule will be in place during the 2015 NIT postseason tournament (31 games). The key number is that possessions per team, per game actually dropped by 3.9% (75.7 to 72.8) from last year to this year. These exhibitions were played at a faster pace than the regular season average (69.2 in the non-conference, 66.5 in conference play last year). This means possessions were ever so slightly LONGER this year. Scoring dropped 4.9% (75.8 to 72.1 PPG), but points per possession only dropped 1.0%. Fewer free throws were attempted (down 9.6%) and less fouls were called (down 3.2%) this year. By default, that means longer possessions. It is very difficult to gauge how much a factor fewer personal fouls and free throw attempts are having, but I think it’s at least some if not most. The fact that points per possession (PPP) dropped far less than points per game (PPG) supports this theory. Taking it one step further, scoring is down 7.2% from last year through the first six days of the regular season (compared only to the first six days of 2013-14). Free throw attempts are down, possessions are down, and both steals and turnovers are up. 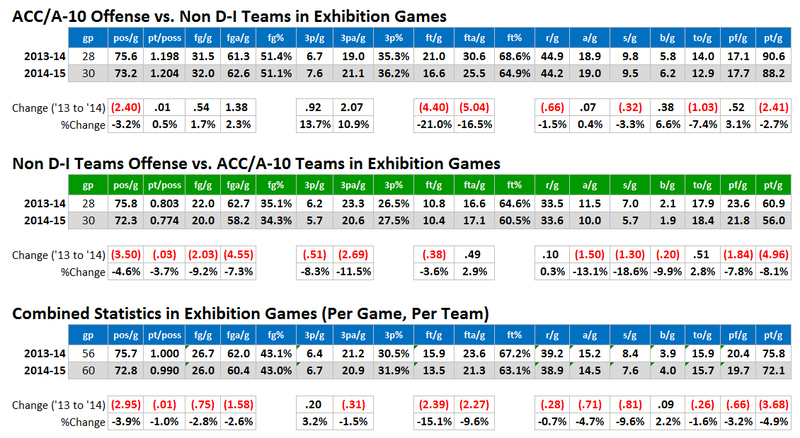 A good portion of the difference between the exhibition game comparison and the regular season changes seen so far this year are relatively similar. At best, the use of a 30-second clock had little effect within this sample size. At worst, it’s inconclusive. Moving to a 30-second shot clock is a positive, but it is only a small part of a bigger solution. Posted in College Basketball, KPI Sports and tagged College Basketball, KPI Sports.